Summer is here! The sun has brought life to these woods I live in. Suddenly there’s bikers and picknikers everywhere. Little childen play in the fishing ponds and hikers go out to enjoy the green area. On my only day off last week I took a bus to neighbouring city Hoogstraten to enjoy an afternoon in the sun with my friend Susan, a bottle of fresh apple juice and some pastries from a local bakery. I hadn’t seen Susan since February so we had quite some catching up to do! From boys and festivals to New York city and the past exams, we were still happily talking when I stepped back on the bus home. It was a good day! On this sunny day I was wearing a few of the new things I got on my trip the the US. I believe I’ve been wearing this Old Navy tee ever since I got it on one of our first days in New York. I’s so comfy and has a nice, bit of a slouchy fit. It has the perfect shade of grey that makes the coral and turqoise accessoiries pop and it pairs very well with this beautiful white lace skirt. The bracelets are from J.crew and I got them on sale, just like my new patent black flats from Nine west. Those have a cute golden accent near the heel that makes them stand out a little more than the average black flat. Your skirt is so cute, I love the texture of it! YOU LOOK GORGEOUS!!! I think you did an absolutely fab job with the accessory combo!!! I hear ya–all my usual photo spots are fraught with people and while I find it awesome most of the time, for outfit pictures I find it highly irritating! I love your lace skirt! How pretty is that skirt? You look adorable! Old Navy always has the best tees! 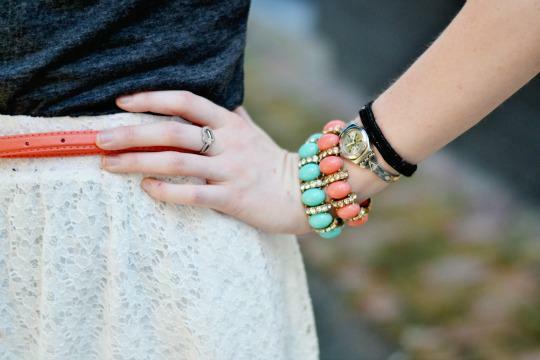 I'm so jealous about your crew bracelets ;-))) And of course the skirt is lovely, I love lace this summer! such a great skirt, i just bought a lace skirt and i cannot wait to wear it! And your style is killer… I'm always inspired to put together new outfits when I come here. It's so fun to see you wearing clothes from your trip 🙂 That tee does look uber comfy…and I like the contrast between the slouchy relaxed look and the super feminine pretty skirt. Love the lace skirt paired with the tee, it looks really good! 🙂 Your accessories are lovely too! Heel mooi. Je hebt een leuke stijl. I love your arm candy! Where did you get your bracelets? I saw your comment on my blog and I thought I'd take a look at your blog. This skirt is adorable! I have a pencil skirt that is very similar that I am head over heels for! You look adorable :)! Loving your blog! I love your skirt and it's great with black!! Simple and very cute! I really love your pretty lace skirt. Wat een mooie rok! En ik hou van de combi met je kleurrijke armbandjes en riem! 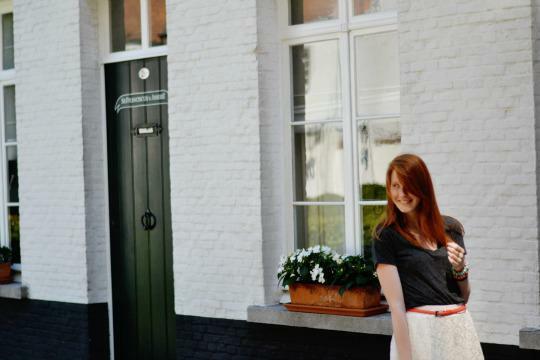 That lace skirt is gorgeous on you Nikki, and I love how you paired it with a plain tee – so cute!